Living alongside growing numbers of students can be a nightmare for local residents and universities must take action, a report has urged. The Universities UK report says a burgeoning student population can offer many benefits to the surrounding area. However, it can also bring increased incidences of anti-social behaviour and excessive pressure on housing. The report sets out "best-practice" guidelines on how universities can build relations with the community. The report, Studentification: A Guide to Opportunities, Challenges and Practice, acknowledges that students tend to live in concentrated areas after leaving their halls of residence. This can bring economic and social benefits but there also areas of conflict. Queen's University in Belfast recently announced a crackdown on student behaviour following complaints of noisy late-night parties, rowdy drunkenness and vandalism. Six universities - Brighton, Canterbury, Leeds, Loughborough, Salford and Nottingham - were used as case studies for the report. Each has sought to tackle any potential friction arising from a large, transient population of students living alongside permanent residents. 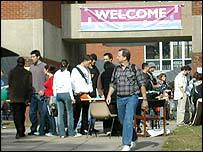 At Loughborough, matters came to a head in 2002 when the university put in a planning application to extend a hall of residence. The plan was rejected after local residents objected and later produced a CD of noisy students to highlight the problems they faced. Alison Barlow, the university's Community Relations Officer, said students must now sign a code of conduct which gives the university the power to take action if they misbehave off-campus. The university now has two community wardens. These full-time members of university staff give advice to students and also act as a point of contact for residents. There is also a 24-hour helpline for residents to call. We have got 1,000 students going out and volunteering in the community. "Residents can ring this if there's a problem with, for example, a particularly noisy party," said Ms Barlow. "The head of security then has the power to discipline students." Discipline usually runs to a fine although the university does have the ultimate power to either expel a student or withhold a degree. Ms Barlow stressed that the university had a lot of positive things to offer Loughborough. "We are the town's largest employer and one of the biggest economic contributors to the town." 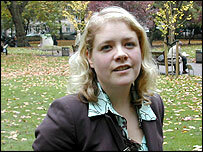 Ceri Nursaw, is head of Leeds University's city and regional office, and has responsibility for community relations. She said that in 2000 the university became increasingly aware of discontent among residents in areas such as Headingley, which attracted a large proportion of the city's student population. Leeds now has a housing strategy developed alongside the city council which is aimed at addressing the problems associated with students living in a concentrated area. Ms Nursaw added: "We have got 1,000 students going out and volunteering in the community. I know there are some community groups which would find it difficult to function without student volunteers." Report author Dr Darren Smith, from the University of Brighton, said different strategies would work for different institutions. He said he hoped universities would take on board the report's "check list" of points of best-practice. He added that there were many areas in cities including Leeds, Nottingham and Coventry, which had lost large chunks of students and were clamouring for them to return. "There is an economic aspect but also spin-offs like transport, GP services and a cultural ambience." The National Union of Students said it welcomed the report's acknowledgement that students can make a positive contribution to the community. Veronica King, NUS vice-president welfare, said: "We have moved on from the outdated stereotypes of students stealing traffic cones and going on rowdy pub crawls. "These days students are more likely to be found working behind the bar than in front of it." Higher Education Minister Bill Rammell said: "The solution to problems between students and local residents is not segregation, but better integration." Professor Dummond Bone, president of Universities UK, said research showed that inaction and lack of communication in the past had led to friction but institutions were now tackling the issue. "Rather than ducking the question, universities have become much more proactive about the issues raised by the accommodation of students and are now developing clearly defined strategies to work with established communities," he said.